I made a pot of this today, and it turned out really well. 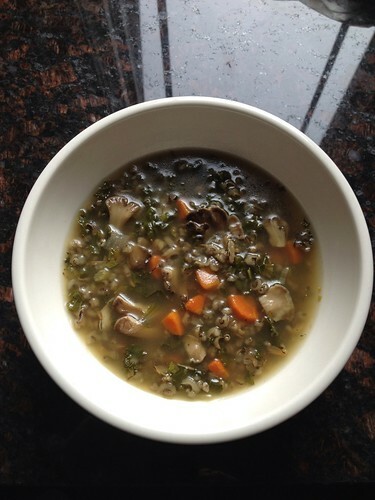 The wild rice, mushrooms and kale all have earthy flavors and combine to make a hearty, flavorful soup. I used mushroom stock I made from stems, and later added a tablespoon of chicken base to make the broth more flavorful, and add some salt, since the stock had none. One note: I didn’t measure the ingredients, and the amounts below are estimated. I strongly recommend tasting and adjusting along the way. 3 c. chopped wild mushrooms. Hens of the Woods work very well in this soup. Prepare the wild ride: Heat 4 c. water to boiling, add wild rice, cook for about 20 minutes or until rice is al dente. Rice will end up cooking completely when added to the soup later. In a pot large enough to hold all of the ingredients listed above, heat the olive oil over medium heat, and add the onion and cook until soft. Add the carrots and celery, and cook, stirring occasionally, for about 5 minutes, until veggies start to soften. Add garlic, bay leaf, thyme and sage. Cook a few more minutes, stirring. Add mushrooms, cook another 5 minutes or so, stirring. Dump in rice, including its cooking liquid, and add stock. Simmer for about 30 minutes. Add kale, and cook until tender, about 10 minutes. Taste, and adjust seasoning, adding salt and pepper as needed.